Also among Band’s credits are Evil Bong (2006) and Evil Bong II: King Bong (2009), stoner comedies “with a little horror mixed in.” Stoner movies, with the possible exception of Harold & Kumar Go to White Castle, don’t do much for us. So the release this week of Evil Bong 3-D: The Wrath of Bong didn’t sound like must-see cinema. But then we read the interview AV Club’s Mark Riechers did with Brand about his latest effort and found out that it features Sniff-O-Rama. Neato! The movie achieves its 3-D effects with the old-fashioned red and blue glasses, and Sniff-O-Rama is eight odors on a scratch-and-sniff card. Sounds like about the right level of technology for the Bong series. Band likes to road show his films in stand-alone movie theaters instead of multiplexes, so he can be free to do a live show on stage and sell all kinds of tasteless film-related merchandise like the Monsterbra or Puppetmaster replicas. Either of which would look great in our screening room, come to think of it. 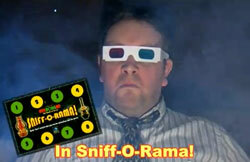 AVC: How does “Sniff-O-Rama” make your job more complicated? Did you need to have a script supervisor to keep track of odors on set? CB: [Laughs.] No, it’s really grafted into the script. The timing is always interesting—most people haven’t been to a movie with a scratch-and-sniff card. It’s pretty simple: Number will come up on the screen, and you scratch that number. It ties into an action happening in the film. But it takes a moment or two for people to get the card and recognize that, say, number three has come up. People are smelling something or are reacting to a good smell or a bad smell, and it’s a little tricky to time it so the gag still works. But other than that, it’s just about inventing moments that will amuse people. We’ll definitely catch it if we can. DEoes anyone have a list of the 8 scents? I didn't see it in the interview. "Best yet are the "Sniff-O-Rama" cards that contain eight numbered circles corresponding to numbers that flash on the screen at particular spots in the movie. It's a great idea, unless you're carrying the card around for awhile before showtime: The general consensus was that, even pre-scratched, they smelled like cat urine (a far more pleasant odor, believe it or not, than circle number six)." I browsed thru Chas. Band's website which is a shambolic mess, but which sells all kinds of stuff associated with his movies. . . except for Sniff-O-Rama cards. Not even an email address to try to cadge a review copy. I appreciate your devotion to the cause. Maybe they'll show up on eBay next week. On a semi-related note (driving in to work this morning I heard a story on NPR)do stink bugs in Allentown, PA, count as an urban smellscape that you want to immortalize in prose before it vanishes? I'm curious whether stink bug juice might be useful in low concentrations, sort of like natural civit. But Rochester is sadly lacking.